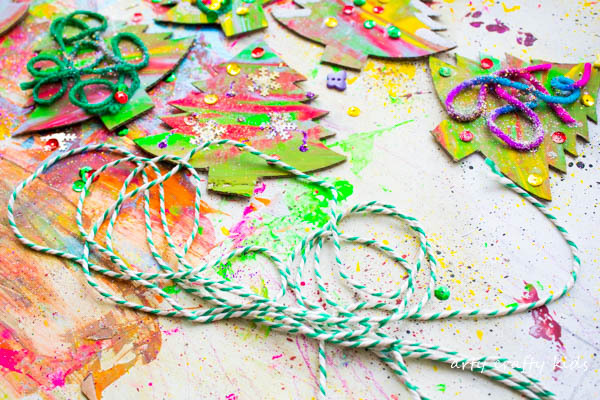 This gorgeous Christmas Tree Garland Craft is entirely process led. 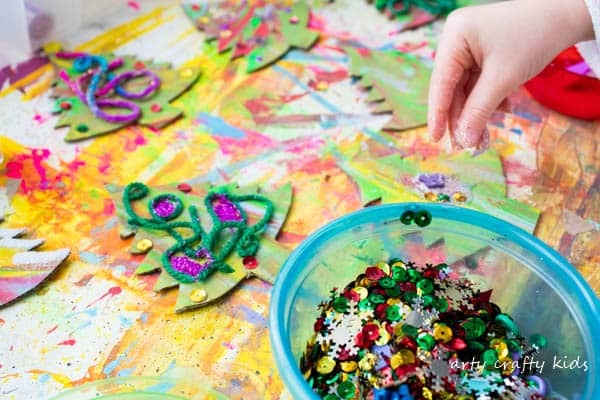 Using the scrape painting technique to create a unique and colourful tree canvas, kids are free to decorate their trees using glitter, sequins, buttons, yarn, string and anything else they can clasp their hands on. Depending on how you approach this activity, this not a quick 5-minute craft. It’s a fun and rewarding project that can be recreated within the home or form part of a lesson plan within the class room! The tree could be replaced with a handprint to personalise it further. So let’s gather the materials and an old cardboard, and get started! This craft may contain affiliate links to recommended products. Arty Crafty Kids will be compensated a few pennies for every purchase made, at NO extra cost to you! 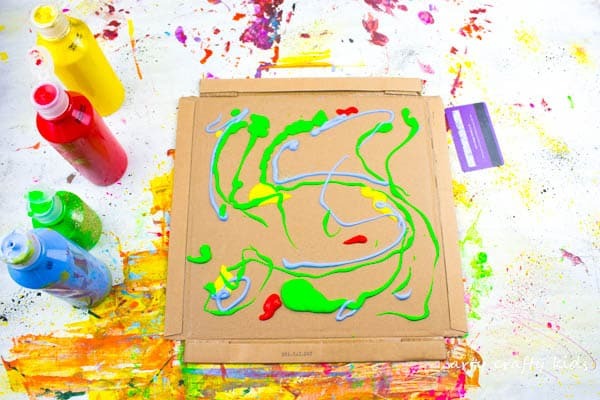 Step 1: Begin with a cardboard box and squirt a small amount of paint directly onto the canvas. Step 2: Next, take an old plastic card and literally scrape the paint across the cardboard, from one side to the other, catching a number of different colours within a single scrape. This will create a gorgeous blend of colour! 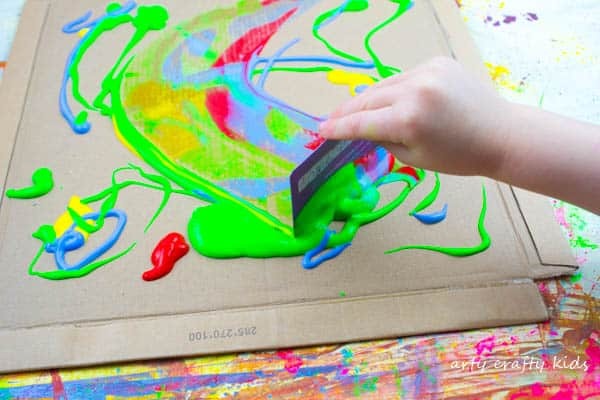 Wipe away any excess paint from the credit card with a tissue and repeat the process until the cardboard is filled with colour. 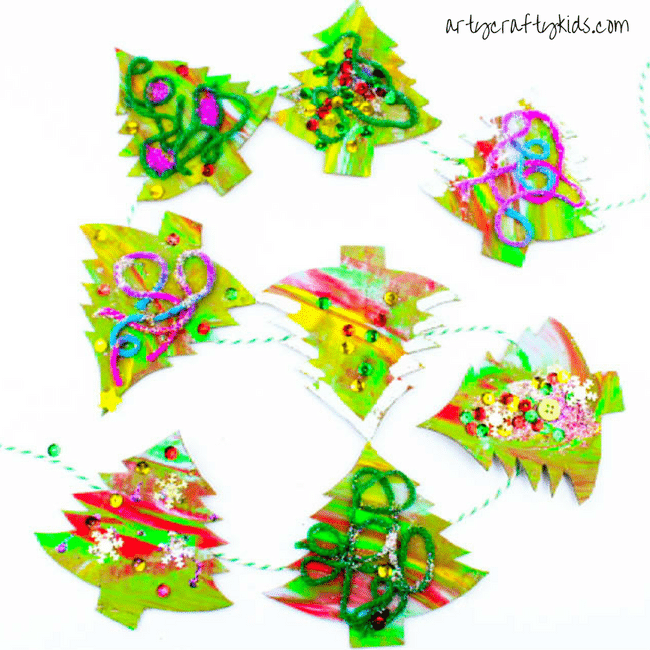 Step 3: Draw your own Christmas tree onto a piece of paper, cut it out and use it as a template to create multiple trees of the same shape and size. Alternatively, you could use your child’s handprint, which could look super cute! 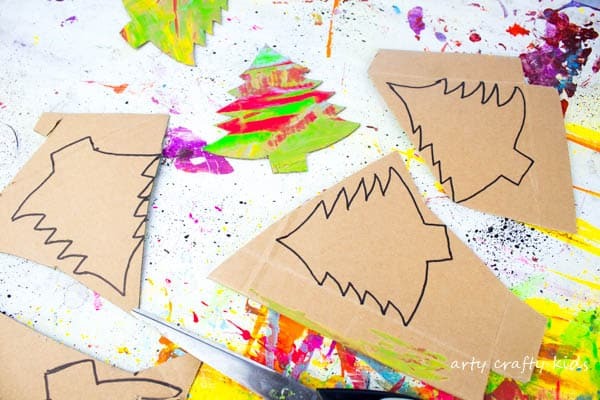 Step 5: Give your Arty Crafty Kids a variety of decorative items to stick onto their Christmas Trees. This element of the craft is great for developing fine motor skills! Step 6: Using a small amount of sticky tape, attach the trees to a piece of twine or string. The gap between the trees could vary depending on a) the number of Christmas you have to attach and b) where they will be displayed! They could be placed above a door, along a bookcase or directly onto your Christmas Tree! The Cardboard Christmas Tree Garland Craft is now Complete! 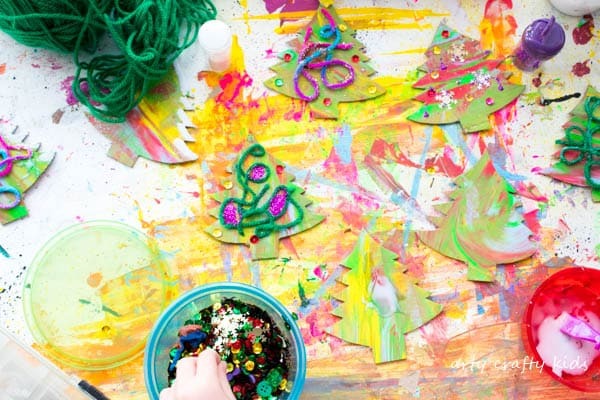 I hope your children love the process of creating their Christmas Trees and you would like further festive inspiration, take a look at our other process-led Christmas Crafts for Kids!